Roy accepted the invitation to give the speech under known conditions. He submitted text, supposedly in good faith. The school trusted him to meet his commitments. Instead, he hijacked the graduation ceremony for his own religious agenda. One spectator told reporters that “it took a lot of courage” to do what Costner did. Baloney. There was nothing brave about his stunt. What was the school supposed to do? He had graduated. He couldn’t be arrested. Tackling him or turning off his microphone would have disrupted the ceremony further. He took no real risks: it was grandstanding. It was also a betrayal of trust, a broken promise, unfair to those who didn’t come to the a graduation ceremony to hear a sermon, and disrespectful of the school and attendees who were not religious. It was a purely unethical act in multiple ways. It was neither admirable nor noble. If Costner wanted to protest the decision not to allow prayers at graduation, he could have declined the honor of speaking. He could have boycotted the ceremony. He could have carried a sign outside the festivities. Lying about what he was going to say, however, and double-crossing his school to give a forbidden prayer is no better, ethically speaking, than throwing away his speech and doing a Chris Rock routine, singing “Me So Horny,” or mooning the audience. Those who applauded him for this inconsiderate and selfish act were as ethically out of line as he was. It is important to distinguish between “individual” and “government” speech about religion. The constitutional principle of separation of church and state does not, as is sometimes heard, purge religion from the public square–far from it. Indeed, the First Amendment’s “free exercise” clause assures that each individual is free to exercise and express his or her religious views–publicly as well as privately. The Amendment constrains only the government not to promote or otherwise take steps toward establishment of religion. As government can only act through the individuals comprising its ranks, when those individuals are performing their official duties (e.g., public school officials organizing a graduation ceremony), they effectively are the government and thus should conduct themselves in accordance with the First Amendment’s constraints on government. When acting in their individual capacities, they are free to exercise their religions as they please. While figuring out whether someone is speaking for the government in any particular circumstance may sometimes be difficult, making the distinction is critical. Notwithstanding the oft repeated claim, prayer has not been banned from schools. While public schools (arms of the government) are rightfully constrained under the First Amendment from promoting religion by conducting prayers, individual students are free to exercise their religious liberty at school, including by praying, as long as they do so without disrupting school functions and activities. Here, the school apparently endeavored to abide by the Constitution’s constraints on it by directing its employees conducting the graduation ceremony and those it invited to speak to the audience it assembled for the ceremony to refrain from religious speech. The boy decided to accept the school’s invitation to speak, deceive the school with respect to his intended remarks, and offer religious speech that the school had told him could not be offered as part of the graduation ceremony. Ironically, because he so plainly was not speaking on behalf of the school when he violated its directions, the school can hardly be faulted for unconstitutionally offering government speech about religion. (If others routinely make a habit of this practice, though, the school might come to be seen as complicit if it does not put an end to it.) The boy may be faulted for deceit, boyish rudeness, and breaking school rules (hardly unusual offenses by graduating seniors), but little else. His tweaking of the noses of school authorities may also be seen as comical and perhaps even sophomorically heroic. To the extent, though, that his aim was to stand up for religious liberty, his actions reflect a failure to appreciate the difference between government and individual speech and the difficulty sometimes of making the distinction. Great post, Doug. Much appreciated. Fine, and end of argument. I can’t resist leaving “shools” right after a sentence calling me stupid. Riiiiight. The kid recited the Lord’s prayer. Reciting a prayer is by definition, praying. He didn’t have to. Ministers recite prayers all be themselves. The school didn’t want the exercises converted into a Christian prayer meeting. That was its right. No, it wouldn’t have been fine. He agreed to give a particular speech. He broke his word. The content beyond that didn’t matter. Not an argument, and pathetic after what you have offered so far. Who believes that? Of course he had an agenda_he wanted to grandstand for God and Christianity. he can do it someplace else, not in front of a captive audience that didn’t come to hear it. Nothing in the post or the blog supports that accusation, jerk. Bye! You have made a fool of yourself, and precluded the chance of redemption. Not that you appear capable of achieving it. I guess Jeff Pogue is either Roy Costner IV or his bff. Because this sounds like typical “youtube-teenage-lingo” to me. This is where all the hypocrisy of this article lies. It’s like telling to Rosa Parks that, if she wanted to protest about the bus seat rules, she should refuse to board it or walk next to it with a protest sign. Yeah right. Nice try. The atheists and the ireligious are trying to limit the religious freedoms today. We don’t need “freedom FROM religion”. We need freedom OF religion. All religious denominations including agnostics and atheists can live in peace only if they’re all free to express their religion whenever they feel like it. Advocating absence of religion is advocating only one of the many religious denominations. That is pure liberal fascism and if you try to enforce it legally, then you can expect a lot of vigilantism and in many forms. I’m sorry: that’s a cheap and idiotic analogy. Rosa Parks had an absolute right to ride on the bus and sit where she wanted. 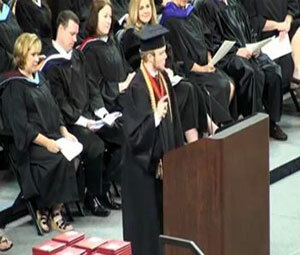 Costnet had no such right to be a valedictorian OR to speak at the graduation through the schools microphone, OR to say whatever he wanted, OR to convert the excercises into a prayer meeting for his own deity. Rights and privileges are two different things: denying the first is unethical, denying the second may not be. Lying is always unethical—Rosa Parks did nothing wrong. Costner did. Rosa Parks had an absolute right to ride on the bus and sit where she wanted. Art the time she rode the bus, separate but equal was still the law as applied to public transportation. As a matter of fact, the Supreme Court had not struck down separate but equal in any context outside of public education. She still had the right, whether the Supreme Court had come to its senses or not. Brown confirmed that she ALWAYS had the right, and that “separate but equal” was a Constitutional breach that never should have been endorsed. Brown confirmed that she ALWAYS had the right, and that “separate but equal” was a Constitutional breach that never should have been endorsed. Brown was decided before she was arrested for violating the segregation law. As to why Brown did not obviate the enforcement of racial segregation on public buses, one need not go further than reading the ruling itself. We conclude that, in the field of public education, the doctrine of “separate but equal” has no place. By its own terms, the Supreme Court only carved out an exception to Plessy v. Ferguson, albeit a significant one. It did not repudiate all applications of the Plessy doctrine, and I am unaware of any Supreme Court ruling between the time Brown was decided and the arrest of Rosa Parks that eliminated the Plessy doctrine or excluded public transportation. Sasha, I agree with you. I think all schools should allow all teachers and students to pray,erect sacred/atheistic symbols or icons in their classrooms, and be who they are. Students can observe and learn, accept or reject as their individual preferences or family traditions lead. That would be true multiculturalism and diversity. I went to a Jewish preschool as a Christian and was never offended or excluded by any of their practices. It enlightened me and broadened my understanding of other cultures. This would be a just law. Teacher’s are agents of the government. Once the government starts dabbling in religion, your religious beliefs are not safe. Chances are, your specific beliefs will not be those adopted by the government. I think this to be wise and sound advise. Children do not seek/chose religion of their own accord. IMHO they should be first introduced to it when they can make an informed decision about entering into faith. He was absolutely free to push his religious agenda except when he was giving a speech at a public school. During that time, he had government entanglements, and, as such, had to limit his speech. This isn’t difficult. Agnosticism is not a religion. What would that even mean? There are agnostics referring to all sorts of different religions. Atheism is also not a religion. More importantly, neither atheism nor agnosticism was enforced here. Secularism was. Secularism is definitely not a religion, nor is it liberal fascism. It’s built into the constitution.